Linda has a BFA degree from Tufts University and The School of The Museum of Fine Arts, Boston. She had a rigorous training copying Old Master paintings in the atelier of the Museum of Fine Arts and has 30 years experience creating murals and art (realistic and abstract) for corporations, medical centers, resorts, and private clients across the United States. Her work is known for depth, dimension and clever content. As an instructor, she is known for her enthusiasm and the individual attention she gives each participant. Corporate and residential murals, custom paintings, and color consultation. Speaking/demonstrations/workshops for groups to enjoy relaxing together, inspire creativity, develop skill-building, and improve team building. See TALKS page. Coaching and private lessons to develop concepts, designs and final art for murals, paintings, illustrations, logos, digital graphics and any creative project. 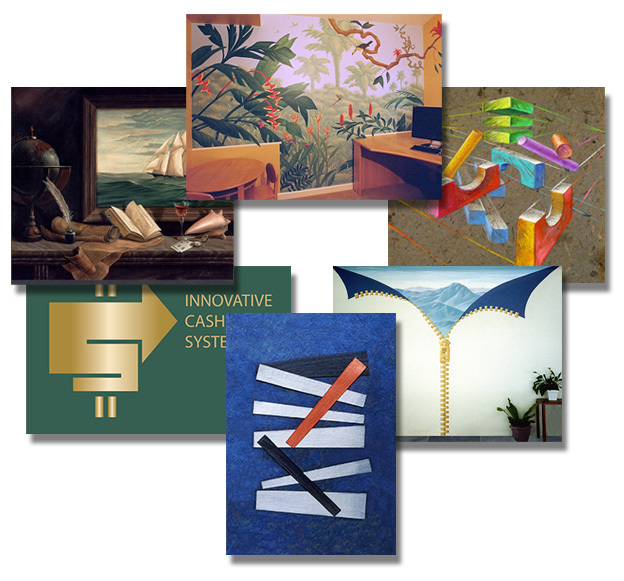 Portfolio coaching to create dynamic art portfolios for art, design, and architecture. Judging for art exhibitions and competitions (all ages and levels).